With our Tooth Fairy and Tooth Costume you'll be transformed into the magical tooth fairy and her treasure—a tooth! The tooth fairy found this tooth lying under a pillow. With just a little magic she is off and flying away to her castle, with this fancy tooth in tow. The tooth fairy can't be separated from her treasured tooth! 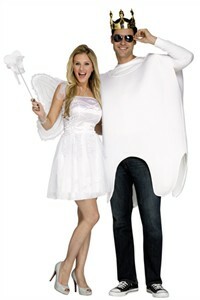 This costume includes one tooth costume tunic and crown and a tooth fairy dress with wings and wand. Availability: The Tooth Fairy and Tooth Costume ship in approximately 1 business day.